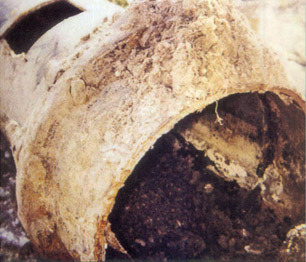 This report includes photo samples from an 18″ Protecto 401 lined ductile iron gravity sewer main – which collects septic sewage from individual holding tanks. (A septic tank effluent pumping system). Construction on the line began in 1984, and was completed in 1986. The hydrogen sulfide concentration averaged 800 ppm – with recorded concentrations as high as 3000 ppm. 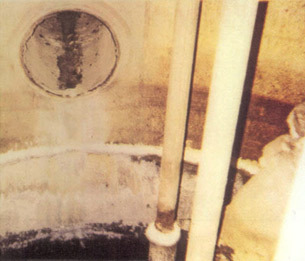 This produced a corrosive effect so severe that the flanges on pipe in the pumping station wet wells were destroyed, the lock on the exterior of the pumping station corroded away, and the PVC lined concrete walls crumbled. Protecto 401’s protection of the ductile iron pipe remained intact. 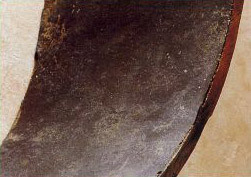 Flanges on unprotected flanged pipe in the wet well were destroyed by severe conditions. Protecto 401 lined ductile iron pipe coming into the wet well shows no effect from sewer liquids or gases. Protecto 401 lined ductile iron pipe was removed when the manhole was replaced. 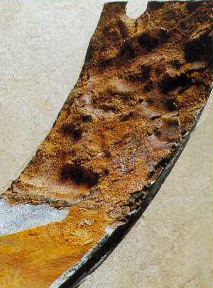 There is calcium sulfate built up on the lining of the pipe – but there is no undercutting of the lining, or deterioration of the joint. Protecto 401 is a ceramic epoxy formulated specifically for lining ductile iron pipe and fittings. Protecto 401 is resistant to sewer liquids and gases – and resists undercutting from exposed edges. The 18″ ductile pipe in this system was lined with Protecto 401 . A 24″ cement lined ductile iron sewer pipe, installed at the treatment plant where the 18″ line discharged, was exposed to the same environment. 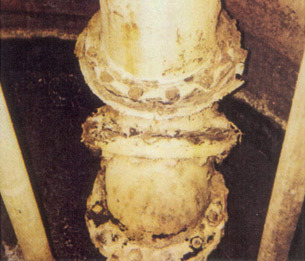 Partially full sewers produce hydrogen sulfide – which forms sulfuric acid and attacks all cementious linings. 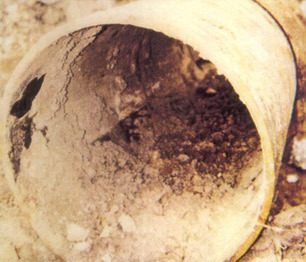 The concentration of hydrogen sulfide in this system increased the rate of attack on this cement-lined pipe. Protecto 401 lined ductile coupon cut from the crown of the pipe 4 south of replacement manhole. 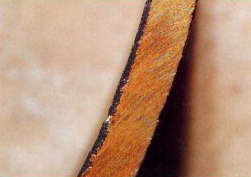 No effect on pipe or lining from sewer liquids or gases (so”me edge damage on the coupon, caused by abrasive cutting). Cement lined ductile iron pipe cut from treatment plant. 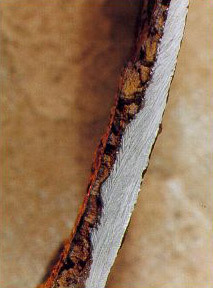 No effect below the flow line, severe corrosion above the flow line.